One of the first horse trailers appears to have been built around May of 1958. A small two horse bumper pull built by Stidham trailer manufacturing in Chickasha, Oklahoma. The invention of the atomic clock, the credit card in 1950 by Ralph Schneider. First Satellite in 1957 Russia’s Sputnik I. This was the decade where people built bomb shelters, had babies and the news was filled with what the reds were doing or planning to do. This was also a time of great affluence after the depression and in which the World Wars “consumerism” took off in a big way which in turn created jobs and money in a circle of growth. It is true then that the wealthy became wealthier and the poor class remained poor. During the 50’s, the first two horse bumper pull that was built was only 5’ wide, 9’ in length and 6’ in height. Compared to day’s widths of up to 8’, heights of 8’ and lengths of stalls up to 12’ for larger draft breeds. 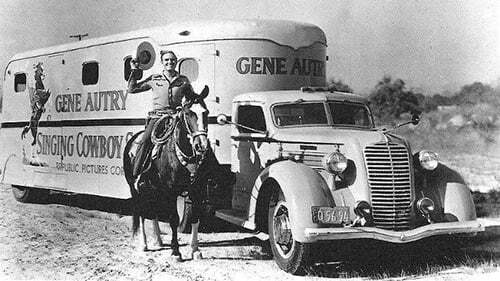 The first horse trailer was towed with a ¾ ton GMC truck more than likely with a 6 cylinder engine. Horses have been a part of the lives of mankind since time began but not until the advance of vehicles, improvements in the countries road system and the influx of higher paying jobs did the need arise to begin to haul the horse. Folks started traveling more, spending more time vacationing and of course, the favorite past time of trail riding began. As trail riding became more popular, the demand to haul the horse increased as well. Several horse trailer companies began in the 1960’s to supply the demand of the two horse bumper pull trailer to cater to the horse trailer industry. In the 1970’s, demand for horses continued to grow and with the invention of the gooseneck horse trailer, versatility increased with being able to trailer many horses at one time. Horse trailer configurations changed from straight load to slant load to box stalls to fit the growing needs. By the mid 1990’s, the horse and horse trailer industry had grown to a multi billion dollar market. Manufacturing companies all across the country continued to improve on materials, quality went up and pricing became more affordable with assembly line production. Today, horse trailer prices range from $7,000 for a small bumper pull up to $100,000 or over for the larger living quarter trailer. Banks offer financing terms up to 15 years which allows for an attractive low monthly payment. Combined with today’s low interest rates, booming horse population, long term financing availability as well as the pick up truck craze in America, the horse trailer industry is on target to hold strong for years to come. 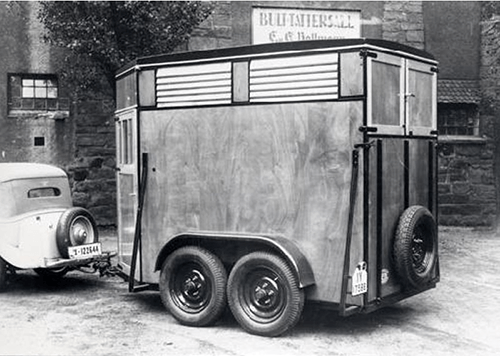 Read more fun facts about horse trailer history here.